WRBH’s mission is to turn the printed word into the spoken word so that the blind and print impaired can receive the same ease of access to current information as their sighted peers. WRBH 88.3 FM began as the dream of a local mathematician, Dr. Robert McClean. Dr. McClean was blind, but he had a vision: a reading radio station that would operate on the FM dial, rather than on sideband frequencies that require special radios to pick up the signal, with strong programming content that would improve the lives of blind and visually impaired persons wanting to lead productive, fulfilling lives. In 1975, Dr. McClean began leasing airtime from WWNO and renting studio space from New Orleans’ Lighthouse for the Blind. By 1982, his efforts expanded when he purchased the 88.3 FM signal, officially making WRBH the United States’ first 24-hour reading radio station for the blind. Today, WRBH remains the nation’s only full-time FM reading radio service and is one of only three such stations in the world. In 1992, WRBH moved on to purchase a 4,000 square foot, 19th-century Victorian building on New Orleans’ famed Magazine Street. The building has been the home of WRBH’s recording studio and administrative space ever since. In the year 2000, WRBH expanded further by adding its programming to the internet via live audio streaming and podcasts. In 2014, WRBH partnered with Hero|farm, a New Orleans based marketing and design firm, to redesign its website, making it fully compatible with screen reader software. Now the station impacts the lives of the visually impaired not only in the New Orleans region but also all over the world. The majority of information in print and on the internet is not easily accessible to those who cannot read. For the blind and print impaired community, this lack of access to information can increase a sense of isolation, lower their standard of living, and become a serious obstacle in everyday life. WRBH seeks to keep everyone equally informed by providing access to news and information, promoting cultural enrichment, and encouraging mental and emotional independence for those who cannot read. WRBH offers a wide variety of programming, including local and national news, best-selling fiction and non-fiction books, magazine articles, children’s books, event calendars, interview segments, health programs, cooking shows, and grocery store ads, as well as shows geared toward Spanish, Haitian, and Vietnamese communities. This programming is available 24 hours a day, 365 days a year thanks to nearly 150 dedicated volunteers who donate nearly 5,000 hours annually, allowing WRBH to fulfill its mission to turn the printed word into the spoken word so that the blind and print impaired can receive the same ease of access to current information as their sighted peers. Additionally, WRBH produces several in-house shows, including Charlie’s Music Show, where host Charles Smith interviews musicians of all genres, Writers Forum, which provides an opportunity for local authors to discuss their work, and New Orleans by Mouth, moderated by Amy Sins. WRBH’s target audience includes the blind and illiterate as well as individuals who are unable to read due to illness, spinal cord injuries, eye muscle damage, learning disabilities, lack of access to print media, and loss of vision due to age. While the majority of reading services for the blind use mechanized voice software, WRBH is the only organization providing this variety of programming via the human voice thanks to over 150 volunteers who donate nearly 5,000 hours annually to read printed information. This makes WRBH’s programs particularly of interest to the newly blind or those who have experienced age-related vision loss, since it can take several years for the untrained ear to become accustomed to the speed and cadence of the mechanized voice software. In addition, WRBH’s content is also of interest to the general public, who tune in to listen to the news, event listings, best-selling fiction and nonfiction books, short stories, magazine articles, and an array of programs encouraging cultural, educational, and emotional enrichment. Since 2000, WRBH has served blind and print impaired people all over the world by making audio streaming and podcasts available free of charge over the internet. Additionally, WRBH has operated as an FM radio station since 1982. 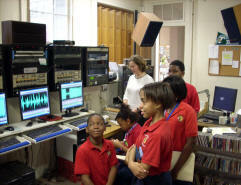 WRBH’s terrestrial broadcasting power is 25,000 watts, making the station’s FM signal available across a 90-mile radius stretching over Hancock County, Mississippi, and the following Louisiana parishes: Orleans, Jefferson, St. Tammany, St. Charles, St. John, Terrebonne, St. Bernard, and Plaquemines. WRBH is the United States’ only 24-hour reading radio service for the blind on the FM dial and is one of only three such stations in the world. WRBH’s goal for the New Orleans community and beyond is to engage, energize, and empower its listeners through access to information and entertainment. In service of this goal, WRBH has been recognized with several awards including a Proclamation of Recognition for 30 Years of Service from the City of New Orleans in 2012, the 1999 Governor’s Media Award, the 1998 Mayor’s Medal of Honor, and in 1990 was named the 257th Point of Light by President George Bush, Sr.
To further its outreach in the community, the station collaborates with the following organizations that share common goals or serve the blind and print handicapped in other ways. Lighthouse for the Blind serves the blind and visually impaired community by providing quality products, services, and opportunities for independence. WRBH guest lectures at their classes twice a year, refers listeners to their services and supports their organization through PSAs. Blinded Veterans Association promotes the welfare of blinded veterans so they may take their rightful place in the community and work with their fellow citizens toward the creation of a peaceful world. WRBH participates in their annual expo and supports them through PSAs. Entergy: Since 2009, WRBH has partnered with Entergy to broadcast Going Green, which educates listeners on energy efficiency. Entergy underwrites the program while Entergy and WRBH generate the educational content. Ben Franklin High School: WRBH partners with Ben Franklin High School during “Hogs for the Cause,” a fundraising festival serving the purpose of providing aid and relief of those variable expenses and economic burdens which families face while their child is being treated for pediatric brain cancer. Ben Franklin High School’s Student Council Members volunteer to help WRBH with the much-needed manpower required to participate in this event. Young Leadership Council: WRBH partners with the Young Leadership Council (YLC) to broadcast “One Book One New Orleans.” YLC spearheads the campaign for literacy, which calls on residents to share the experience of reading the same book each fall. WRBH records and broadcasts an audio recording of the book, read by YLC youth volunteers. Tubby & Coo’s Mid-city Bookstore: Owner of Tuby & Coo’s and WRBH volunteer reader Candice Huber produces a literary podcast for us called Novel Ideas, which can be streamed here on Soundcloud. Help WRBH continue its service to the community!